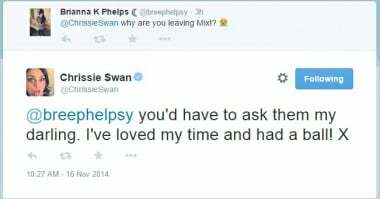 UPDATE: Chrissie Swan responds to radio shock. Big news for breakfast radio fans this morning as the Australian Radio Network announces that from January 2015 there will be new hosts of their breakfast show on KIIS FM: Jane Hall and Matt Tiley. 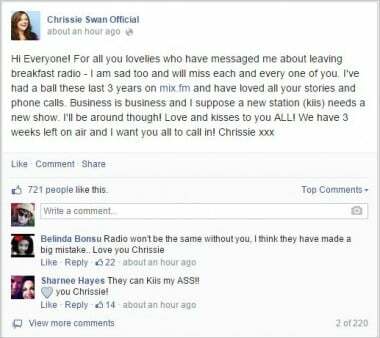 But this isn’t great news for fans of the irrepressible Chrissie Swan – who has apparently lost her breakfast radio spot. 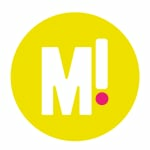 Australian Radio Network has announced Chrissie will be leaving the network and station Mix101.1, where she has hosted breakfast with Jane Hall since 2012. Chrissie and Jane – dynamic duo no more. ARN made the announcement this morning, praising Chrissie’s signature funny and honest style: “Chrissie has been a valued member of the team at Mix101.1 and ARN, where her bright personality and infections humour has endeared her to audiences”. Chrissie has sent a tweet to a fan indicating that perhaps she doesn’t know why this decision has been made. No word yet on the fate of the “3pm Pick-up” radio show, hosted by Chrissie and Jane, but presumably that will disappear as well. 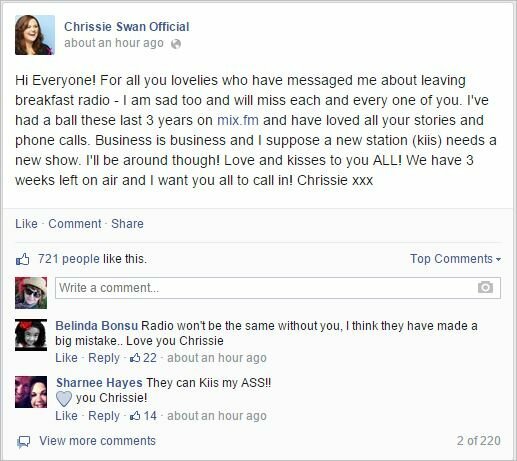 With female radio duos so rare (and so great), we hope that Chrissie will find a new home for her hilarious stylings soon.